Love Eau Intense is the ‘intense’ version of 2010’s very beautiful Chloe Love fragrance. In Bottle: Hint of florals a bit of powderiness and a lot of warm amber and vanilla. Applied: Florals on the opening, a bit of bitterness and powder from what I think might be the iris note. Don’t be scared by that description, the powder and bitterness was barely detectible to me. It enhances the fragrance, giving it a bit of sophistication. As the fragrance progresses, I get the sweet warm amber vanilla fragrance with what I think is a little touch of honey. Love Eau Intense is a very well-blended and well rounded scent. It fades into its end stage with a nice floral dusting on a warm oriental base. It’s very nice, grownup, but also very loud so go easy on the sprayer. Extra: Love Eau Intense was composed by Louise Turner (JLo Glow, Fahrenheit 32) and Nathalie Gracia-Cetto (Burberry Brit, Escada Sentiment). 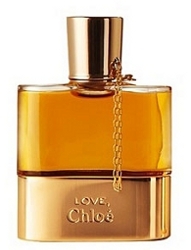 Design: I love the design of Chloe’s Love fragrance line. The shape itself is reminiscent of a hip flask made of glass with a metal band at the bottom. I love the cap with the chain and the overall simplicity but elegant aesthetic. Notes: Iris, heliotrope, hyacinth, lilac, wisteria, balsam, musk, vanilla. Love Intense is fantastic and a great progression from Chloe Love. The original Love was already well done and Love Eau Intense improved upon it, in my opinion. Reviewed in This Post: Love Eau Intense, 2011, Eau de Parfum. This entry was posted in chloe, floral, oriental, Reviews By House and tagged balsam, heliotrope, hyacinth, iris, lilac, musk, vanilla, wisteria. Bookmark the permalink.